Shutter Lag is the time difference of time between the pressing of the shutter release button of the camera and actual movement of the shutter mechanism. Unfortunately, with various kinds of Digital Camera, this shutter lag is not really very well defined in lower end digital camera as the mechanism is nearly fully controlled by software based image processing unit. Shutter lag is an intrinsic characteristic of a camera, depending on the technique used for various components, it is partly mechanical and partly electronic. Take that, I am running away from point A to point B. Theoretically take that these two points are within your camera’s angle of view. You wanted to take the photograph when my feet went out from from point A. You actually pressed at proper time, but you got the photo when my feet touched point B. You can request me to run from point A to point B again, but in practical life, it is quite obvious that, for example a tiger will not keep your request rather might approach to point C (where you are standing). To understand Stutter Lag, you need to understand Shutter Button and Shutter Mechanism in Digital Camera and Shutter of Digital Camera itself. While the current digital SLR cameras now can trigger almost instantaneously, in the range of compact digital cameras, depending on the model and handling conditions today with trip delay the range is expected to be more than one second. Ricoh circumvents the problem in some models for some time by a so-called hybrid autofocus. Here, an additional independent Auto Focus sensor is used. For normal shooting distances by this technique may be a delay of less than 0.1 second and it reaches even more in poor lighting conditions, this system works even without AF illumination system. At the level of macro shots, this procedure however does not work. Newer, higher quality precise camera models from other manufacturers now use powerful processors which also partly plays a role in shutter lag which can be significant – under half a second, lower class models like Mobile Cameras still continues shutter lag to be a real problem as they do not have dedicated hardware image processing unit which determines the other parameters. Information on the shutter lag usually completely be missing in the data sheets of the camera manufacturers, realistic details can be found usually only in independent test reports. Meanwhile, some manufacturers provide this information, but often they deceive the user, because the lag is usually meant by the focus, but this is never the problem with few exceptions. Practically it is impossible to get rid of shutter lag in lower end models. In case of mobile phone cameras, using Airplane mode / Flight mode plus some softwares to stop and close other running programs increases the response time itself. Shutter lag is badly remarkable in Nokia’s N Series smart phones which are almost a kind of defining a standard. The photographer can try to anticipate a situation worth photographing and just trigger a bit earlier before. Actually this is very difficult to express how it can be done in verbal or written language. Sometimes the lag can be of 2-3 seconds for a particular photo, no calculation will work. Probably restarting like Windows PC makes it a bit better (or may be it has been our bad habit to restart for making faster again). After pressing the shutter button half down or locking the focus, the camera will wait a few seconds before the picture is taken. This period can be used to position themselves in front of the lens. How ever this actually does not work in many situations. Unless your wife or husband is a professional stage performer, if you ask to smile again; he or she will call you names. It will not work for our Point A – B – C and tiger model described above. Most husbands are usually among the most fool persons in this world, shutter lag adds a feather for them. So, upgrade to DSLR if you want not to face such situations or fully avoid taking candid photographs. DSLRs has shutter lags too, but usually that is manageable. This Article Has Been Shared 9020 Times! Which Camera Lens are must to buy, is quite important to understand for your need otherwise a top notch lens which you will rarely use, will become a crap. 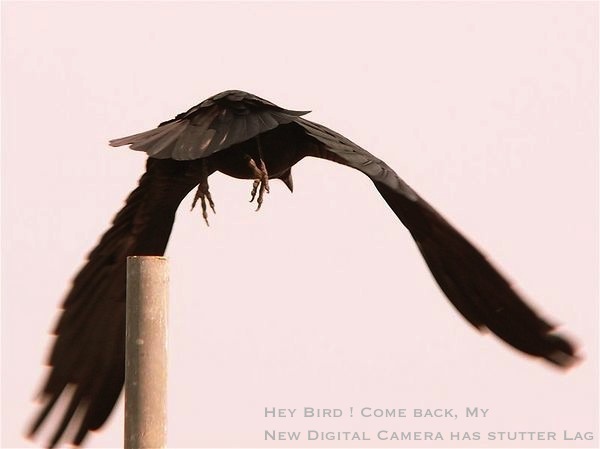 Cite this article as: Abhishek Ghosh, "Shutter Lag and Digital Photography," in The Customize Windows, January 17, 2013, April 21, 2019, https://thecustomizewindows.com/2013/01/shutter-lag-and-digital-photography/.